Treat it With Respect. Basic Elements. Conductors. Wiring Diagrams. Direct Current Circuits. Batteries. Introduction to Alternating Current. Inductance and Capacitance. Alternating Current Transformers. 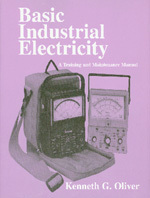 Electrical Measuring Instruments. Electrical Circuit Protection. Plant Lighting. Direct Current Machines. Single Phase Motors. Three Phase Motors. Plant Electrical Distribution Systems. Alternating Current Control Devices. Records, Reports, and Documentation. Electrical Connections. Maintenance Policies. Index.